A vendor was kicked out of a fair in Bloomsburg after visitors of the fair had brought up complaints because he was selling nazi flags. The vendor, Lawrence Betsinger, had a nazi flag displayed outside of his booth. A photo was posted to the fair's Facebook page on Monday displaying the flag outside his booth. Officials removed the nazi flag from his booth and let Betsinger stay operating. 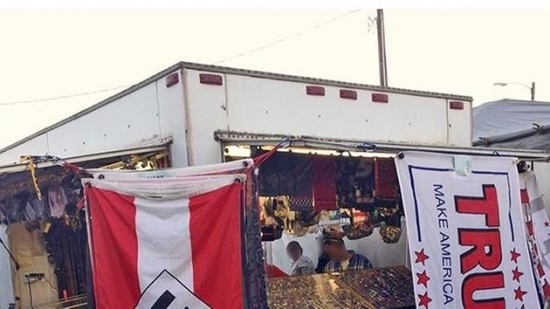 He later replaced it with a Confederate flag, causing the fair officials to shut his booth down entirely. The fair's President Paul Reichart stated, "We'd like this to be a clean, American fair, We're family-oriented, and we don't tolerate these things." Police are now searching for two teenagers who are accused of robbing a 71-year-old man in East Mount Airy. The robbery took place on Sunday September 11th on the 6500 block of Magnolia Street. The victim had just withdrawn money from an ATM. The two teens then followed the victim down the block and allegedly pointed a gun at him. The teens got away with $200, credit cards, and the victim's house and car keys. Today, a chance of rain with a high of 77 degrees in Center City.